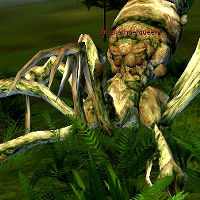 2:43:00 PM ryy if it was indeed me that you saw then neither of the spider queens were adults not fully anyways. Or one might have been and the other on the way. The rancor was due to the old BE bugged pets regestering as lvl 1. So that's the closest thing to an exploit there is. Though call it was you will i didnt see any great advantage to it other then a novalty and a little extra dmg. Sure wasn't going to stop using my rnacor becasue the system bugged it. I bought it and raised it fair and sqaure so i used it asthe system allowd. Anyways on the Arcane Queen mine is doing well and ive almsot completed her tempalte as a tank pet. Since taming mine a couple days after cu ive torn though 40 leairs at least and thopugh i found several widow babies not one more Queen. Leads me to belive that she can be placed on the rare list. 6:43:00 AM i finally tamed one today. :-) it aggroed me on the first try lol and i had on a belt with +2 tame mod, full tame clothes set and a mask scent undershirt, also used tame food with a +17 mod on it, and that mask scent mod stuff that is loot only forget the name :-)...i'm also a master ch lol and lol as i said it aggroed me on the first try lol. fortunatly i'm no novice ch lol i came prepared.. i had already unequiped my high cap scatter pistol, and had called a vehicle. I got on then targeted the baby so i could keep constant track of his postion, then rode around in oval shaped lap around his lair.. i find this the best pattern to breack aggro with on a baby you want to not despawn lol. they seem to follow your path and while they are following it around the oval you are heading the other way and thus giving more distance from you and the baby, yet not running too far from the lair as to force a despawn due to distance from lair. After about 4-5 more tries i tamed it i am soo happy to get it :-) stats wise it is better then the bull rancor at the same lvl across the board. 6:35:00 PM Ryy, there is a secret to doing that, i don't use it( i see it as cheating), but know of it and have promised not to mention how it is done so they would tell me how they did it, but it is possible to call 3 lvl 70s if you had to. That is all i'll mention on it. 10:16:00 PM Good for BEs to sample exspecially when they are making kimos. But i say they should make this tamable. The rarest of rares to get. Such a cool pet and its high leveled like bull rancors. Good tank and pvp pet. 3:27:00 PM These would make great tanks. 2:42:00 AM Ranger freind is claiming these are CL 63 now.